I am a big horror movie fan. The creepier it is ..the better. I also love books by Stephen King, who I believe is the master of horror books. Spine-tingling, sometimes gory and most definitely creepy. And then I read this book! JD Barker knows how to write horror!! I found this story to be eery, creepy, and frightfully good. What I really enjoyed was the pace of the story…kept me hooked throughout. What I also found extremely clever was the story within a story. A hard concept to master correctly…and the author did not disappoint. Admittedly, this book did not scare me to death…but I did peek under the bed a few times and got some shivers up my spine occasionally. The characters themselves were cleverly conceived. I had a picture of each one as I read and I enjoy that experience. Again, a rarity. I also pictured who would play each character should this book ever become a film…and it should!! Without any spoilers, I suspect this is not the last we see of Shadow Cove or the characters within these pages and I am pretty glad about that. This is a definite must read for anyone who likes witchcraft, horror and who is not afraid of a few bumps in the night. Highly recommend and definitely will be reading more books by this author. Watch out Stephen King…JD Barker is hot on the trail of horror writing and will most certainly give you a run for your money!! 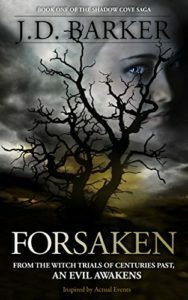 This entry was posted in Book Reviews and tagged #Horror, #Murder, #Supernatural, #Suspense, #Twists by crimebookjunkie. Bookmark the permalink.